Us is another great film from Director Jordan Peele. It’s not as good as his directorial debut Get Out, but it comes quite close to it. I knew nothing about it going in and was pleasantly surprised. Film appropriate for those 15 and above. The premise of the movie is based around Gabe Wilson (Winston Duke) and Adelaid Wilson (Lupita Nyong’o) taking their kids to the beach house to connect with old friends, but when night comes, an estranged family come to their house. However, this is no ordinary family, they look exactly like the Wilson’s… but they’re evil. The performances are flawless. Winston Duke is hilarious but still manages to be scary at the same time, the children Evan Alex and Shahadi Wright Joseph are excellent but the best performance was Lupita Nyong’o, she was absolutely fantastic. In my opinion she deserves an Oscar, but unlike recent years she will most probably get overlooked as the Oscar often ignore the Horror genre. The soundtrack is most probably the best soundtrack I’ve heard in a horror movie. It’s chilling, frightening and is used to build tension at the right moments. The cinematography is hauntingly excellent. Some very chilling shots, especially at the start where the family takes over in the house. Peele’s direction allows us to build a relationship with this family just from the first ten minutes. That’s rare with a movie on this level and Us gets you invested immediately. It’s scarier then Get Out but the reason why I like Get Out a bit more is because it made me feel a bit uncomfortable watching it and was hoping for the same with this which I didn’t get but I wasn’t disappointed. The thing that scared me about it was the evil dopplegangers, the duplicates of the Wilson family and they are portrayed. On top of that the voices were real creepy. The humour worked which I skeptical with going in but Winston Duke (as I mentioned previously) and Evan Alex were hilarious. I left happy because the jokes came at the right moments, timing was perfect. I enjoyed the storyline just as much as Get Out but it was totally unexpected. I was expecting something similar but it’s very different, but just as enjoyable. The story is not straight forward which I was impressed by, you have to dig deeper to find out what it’s all about. The screenplay is excellent. 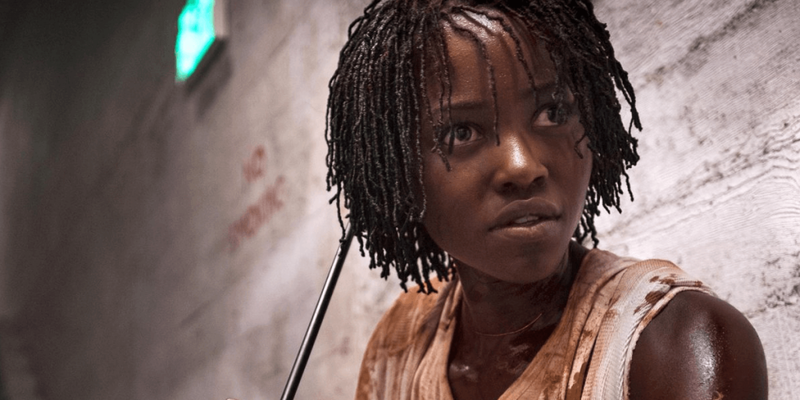 Jordan Peele makes it look easy to balance comedy and horror together. I’ll have to give it a read once it surfaces online somewhere. There’s quite a few metaphors in the movie which I will not get into but they were quite confusing but brilliantly written. Make sure to watch the film so you know what I mean. The costume design is quite unique for a modern day horror, I bet we’ll be seeing some of them worn when it’s Halloween. This is in my top ten horror films of all time and horror is my least favourite genre. The editing and framing is masterful and the cast is astonishing. SPOILER: The third act was a bit far fetched and explained a bit too much that it got quite confusing. When we see Adelaide and Red face to face we find out that Red is actually Adelaide and Adelaide is Red and it got a bit too confusing… You see what I mean? When Red and Adelaide do get to fight one another it has an operatic feeling too it and it didn’t work for the type of movie that it is. There was some horror clichés but I mentioned before I don’t mind clichés unless they’re just shoved in your face for the sake of it. There was the odd green screen issue here and there but nothing that impacted the movie massively. Some jump scares didn’t work but on the other hand they are never effective for me with any horror/thriller film so could just be me. Us is a very different film to Get Out but it’s great at building suspense, the humour is spot-on, the performances are masterful AND it’s scary!